Yury Andrukhovych (Ю́рій Андрухо́вич, 1960) is undoubtedly the most influential, the most translated and the most recognized Ukrainian writer today. An extremely universal poet, prose writer and journalist. He is the vicepresident of the Association of Ukrainian writers, founder of the symbol of the new Ukrainian postmodernism, the group named "BU–BA–BU" – Burleska (burlesque) – Balahan (mockery) – Buffonada (buffonade). Besides novels and poem collections, he is co-author of the book "My Europe" (together with A. Stasiuk). In his novel titled "Recreations" (1990, Slovak translation made by V. Kupka, published in 2003), he mocks the image of a Soviet poet as a holder of the superior truth and ethics and throws him into a chaos of the everyday life. In the apocryphe novel "The Moscoviad", an Ukrainian poet, bohemian and narcissist Otto von V. Finds himself right in the centre of the ongoing fall of the Russian empire, travels through the underground of Moscow, gets drunk and copulates, ironizes symbols of the falling empire and becomes witness of its last spasm, represented by a secret conspiration and an attempt to re-establish the old regime. The last of his prose writings titled "Lexicon of Intimate Places" (Лексикон інтимних міст, 2011) is a novel in the form of memoirs, at the same time, his most extensive work (480 pages) and, as always, surprising for the uncommonness of its form (111 essays on various cities of the world, beginning with all letters of the alphabet) and content. The reviews ad critiques on his works are rather ambiguous and repeat in using the term "geopoetics" with its negative connotations. The author himself called his novel "a puzzle book" and is planning to continue with further parts of it. 2) Bobrova L. The Moscoviad. Journal of Ukrainian Studies. 2009;33/34:591-594. http://search.proquest.com/docview/883898720?accountid=17229. Aj na otázku či literatúra ovplyvňuje alebo či naopak, on ovplyvňuje literatúru odpovedá ukrajinský umelec a žurnalista v relácii pre mládež Про твоє. the political journalism as for his fiction. By introducing irreverent postmodern aesthetics to a culture which has often taken itself too seriously, his work represents a watershed in Ukrainian literature. The literary dormitory at Moscow University becomes a kind of Russian Grand Hotel, serving the last supper of empire to a host of writers gathered from every corner of the continent, and beyond. Young poets from Vietnam, Mongolia, Yakutia, Uzbekistan, Russia, and Ukraine assemble to study, drink, frolic, and explore each other and the decaying city around them. When the supper turns into a bacchanal, who’s surprised? “The empire betrayed its drunks. And thus doomed itself to disintegration.” Part howl, part literary slapstick, part joyful dirge, charged with the brashness of youth, betraying the vision of the permanent outsider, Andrukhovych’s novel suggests that literature really is news that stays news. Funny, buoyant, flamboyant, ground-breaking, and as revelatory today as when it was first published in Ukrainian, The Moscoviad remains a literary milestone. In spirit and intellectual brio Andrukhovych, whose irreverence makes Borat seem pious, is kin to the great Halldor Laxness and the venerable David Foster Wallace. Vyjadrenie názoru a pocitov jednej americkej blogerky po stretnutí s ukrajinským spisovateľom. Dozvieme sa tu o jeho názore na Nemecko, kde bol dokonca 3 krát ocenený. Dotknú sa tu problematiky prekladu, pretože knihy do anglického jazyka boli prekladané z poľského prekladu a nie z ukrajinského originálu. A taktiež dôvod nedostatočného sa šírenia jeho literatúry na území Ameriky. V tomto i keď krátkom videu, môžme počuť a vidieť ukrajinského spisovateľa čítať z jeho významného diela Perverzion. Následne prichádza k prekladu toho istého úseku do anglického jazyka prísediacim profesorom. Myslím si, že je zaujímvavé sledovať a počúvať rozdielnosť v interpretácií daného úryvku. V tomto videu sa vyjadruje spisovateľ na tému Culture at the Edge of the World, or who are the losers?'. Video je trochu dlhšie ale i napriek tomu odporúčam vidieť. Yury Andrukhovych v Prahe, kde sa vyjadruje o jeho dielach a ich prekladoch. Well this guy is doing a lot of interviews..., they are sometimes very interesting, check them out! "people who will never wake up from their social and cultural slumber. Ukraine is often referred to as a country with broken cultural traditions. Do these “broken cultural traditions” add more difficulties to the present-day writer’s work? If we accept your assessment of our time as “the time of broken cultural traditions,” then the main problem for me, a sort of a writer’s curse, is a necessity to go back to things that should have already been said, that should have already happened, and do them again and again." Je zaujímave si prečítať ako sa vyvíjala umelecká tvorba tohto významného ukrajinského spisovateľa, čo všetko ho pri jeho tvorbe ovplyvňovalo, z ktorých rokov pochádzajú jeho diela a aj to čím je jeho tvorba charakteristická. Niečo o diele Kriminálne sonety, na ktorej Yuri Andrukovych spolupracoval s ešte ďalším spisovateľom. Pod textom sa nachádza zopár nahrávok kde čítajú úryvky z diela. Odporúčam si ich vypočuť. V tomto diele hovorí Yuri Andrukovych o Ukrajine, o tom ako sa dištancuje od západného sveta a považuje ju za takú stratenú vrámci Európy. Opäť ešte pridávam niečo z jeho života ale v takom obšírnejšom obsahu. Dozvieme sa tu čím je ako spisovateľ výnimočný a ako prostredníctvom diel pracuje s čitateľom. or Who’s for the Role of the Loser? On March 15 the Ukrainian author Yuri Andrukhovych was awarded the prize for European Understanding at the opening ceremony of the Leipzig Book Fair. In a sensational speech, he attacked EU Commissioner Günter Verheugen who opposes Ukraine's entry into the EU. The newspaper publishes extracts of the speech: "European dialogue has not taken place," Andrukhovych notes bitterly, and makes an appeal to EU countries: "It is crucially important for me that you help this cursed country, in whose language I write and address you in. And it wouldn't be so terribly difficult for you to help this country. It would simply be a matter of not saying anything that will kill our hope." The paper reprints a speech on European borders which Ukrainian writer Juri Andruchowytsch delivered in late November, at a conference in Kiev. "Europe is also unusual in a spatial sense. It's difficult enough with the western borders let alone the eastern ones where all sorts of contradictory definitions have cropped up recently... Where in heaven's name are Europe's disputed eastern borders?... In order to arrive at some sort of answer, one could assume that Europe exists wherever the local people believe that they are part of Europe. Or, to go one step further, wherever they consider themselves to be European. So: Europe is a completely subjective term. A Chinese person in China or in Singapore would never consider himself European, neither would an Arab, an Indian, a Mongolian or an Iranian. But an Azerbaijani might do, and you can be pretty sure an Armenian would." Ukrainian writer Yuri Andrukhovych talked to Ulrich M. Schmid and Andreas Breitenstein about Ukraine, Ukrainian literature and his relationship with Germany, Switzerland and Austria: "I used to idealise Austria but now I'm deeply disappointed with it. In the early 1990s I learnt about the k.u.k myth [the Austro-Hungarian monarchy before 1918]. The Central European idea was totally new to me... Nowadays, Austria distances itself from the Habsburg tradition. No one understands me when I talk about this subject in Austria. People say: that's not interesting; it's outdated. Austria is a cold country of which I dreamed for a long time and which doesn't understand me. For this indifference I have taken literary revenge: perhaps this is why I have the Austrian protagonists in my novels killed, thus killing the Austrian in me, as it were." As the international European festival of literature Kosmopolis begins in Barcelona this Wednesday, October 18th, the Ukranian writer Yuri Andrukhovych explains in an interview conducted by Xavi Ayen, that, like all intellectuals in his country, he is "crazy about everything European. My literary references are European. Paul Celan [a German writer] was born in Chernivtsi, a town that was Romanian at the time and that subsequently became Ukranian. There are several towns here that have changed state or name over the years. For us, it is dramatic that an author like Samuel Huntington should draw a categorical frontier between East and West. According to him, we are a border zone between what is and is not Europe, a sort of limbo land situated between two worlds." Rozhovor s ukrajinským spisovateľom o Ukrajine a jeho názor na postavenie Ukrajiny v Európe. Rozhovor s Yuri Andrukohvychom v ktorom vyjadruje svoj postoj k životu, čo sa v jeho živote za posledných 20 rokov zmenilo, i jeho názor u sochárske umenie spojene so Sovietskym zvazom. Rozhovor je po ukrajinsky, avšak s ruskými titulkami. writings on the walls of the wash houses and bogs. Meanwhile this is about a much simpler thing. they drove them out of the barracks. so many days until the end of service. As far as the first two are concerned it’s clear: Russian, Tatar. But that third one? Where’s he going with a name like that? They couldn’t not laugh at a name like that. He didn’t know himself what it meant. Werwolf! With a black palate! The terror of all villages and towns around! Romantic hero of fairy tales and ballads! Oh indestructible, almost immortal werewolf! Escape before they round you up! Before they aim at you from their wooden towers! Demobilisation inescapable! I know you can do it! Tu najdete dalšie preložené úryvky do angličitny dvoch významných diel Moscoviad a Perverzion. Článok o Yuri Andrukhovychovi a jeho vyjadrenie na to čo to znamená byť spisovateľ. 5 básni tohto výnimočného spisovateľa preložených do angličtiny. Learn About Ukraine From Yuri Andrukhovych. As is the case for most of these writers, with Andrukhovych’s work the issue of the language of a country’s people takes high importance. Andrukhovych fights to preserve the Ukrainian language from being swallowed up by Russia. He’s a culture warrior of the highest order. His recent editorial in The New York Times, “Love and Hatred in Kiev,” details the street scenes of the protests during the recent crisis, depicting police officers this way: “Some have even posed for the cameras, their boots on the heads of victims lying on the ground. They proudly upload these photos and videos to their personal pages at social networking sites.” Most American writers don’t need this kind of courage. We’re rarely choked out by the state and our mother tongue isn’t in jeopardy. But Andrukhovych is a real fighter. Yuri Andrukhovych's acceptance speech for this year's Leipzig Book Prize for European Understanding ruffled feathers in Germany. There's a literary festival called Buch Wien fair on 13 to 16 November in Wien, where Yury Andrukhovych is one of the guests. He will be holding the opening speech about "Ukraine, Europe and literature". Yuri Andrukhovych, Serhiy Zhadan, Oksana Zabuzhko, Oleksandr Irvanets, Izdryk, Maria Matios, Ihor Pavlyuk are the top contemporary published writers to date. 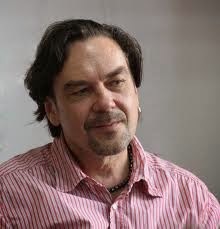 Yuri Andrukhovych is an Ivano-Frankivsk-born Ukrainian prose writer, poet, and essayist. To date, the writer has published five novels, two volumes of essays, four poetry collections, and a cycle of short stories, as well as literary translations from English, German, Polish, and Russian. Украинский интеллектуал, который действительно хочет изменять нашу блядскую ситуацию, предопределён выглядеть в глазах своих оппонентов скандалистом. "As is the case for most of these writers, with Andrukhovych’s work the issue of the language of a country’s people takes high importance. Andrukhovych fights to preserve the Ukrainian language from being swallowed up by Russia. He’s a culture warrior of the highest order." For more information click here. "Ukrainian poet, prose writer and essayist Yuri Andrukhovych was born in 1960 in Stanislav (Ukraine). He is the one credited with having radically renewed Ukrainian poetry in mid 1980's. The poetical group The Bu-Ba-Bu (Burlesque-Blaster-Buffoonery) established by him and his friends, poets Viktor Neborak and Olexandr Irvanets, has forever buried the accepted standards of 'socialist realist' poetry, proposing a new poetical quality, dominated by literary game, carnivalism, urbanism, and total aesthetical freedom."